I run in my Chuck Taylors. These Chucks have been my trusty shoes since my junior year of high school. I’ve hiked mountains, rock-climbed, gone trail-running and danced the two-step in them. I’ve worn them while editor-in-chief of my high school newspaper and while on countless photo assignments in college. They’ve stepped in horse poop, sludged through mud, shimmied up trees and been branded with the Philmont Scout Ranch cattle and horse brands. So, their apple-green color has faded, and they have more holes than my other pairs of shoes combined. I’ve had to retire them from everyday usage and photo assignments, and use just-as-impractical footwear in their place. I have yet to find a new pair in that same color, so I haven’t been able to replace them. 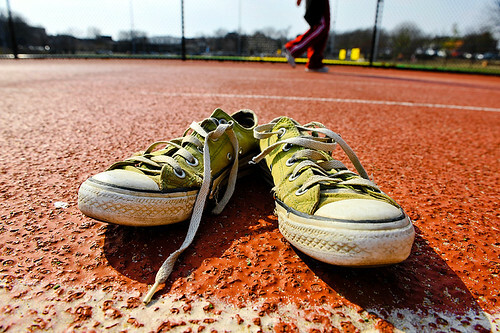 But I still use these Chucks for running because, frankly, I don’t have any other shoe that vaguely resembles sneakers. So I went running today. Because the weather was nice. And I went running in my Chuck Taylors. If they last another year, I’ll be very, very surprised. I thought you got a new pair of these last year?? Nope. I thought about it and went to all the shoe stores that I knew of, but could never find the right color/size. Apparently wearing shoes to death and still running in them is a trend in your family…. the you-and-Matt part of your family at least. You ran in these? That’s a painful, knee-pounding idea. They’re actually the only shoes I’ve run in since high school, except for the occasional pair of high heels when in a hurry. It’s really not painful. I run in chucks too! People stare at me when I run in them, as if it’s something that shouldn’t be done. They aren’t painful at all now. I bet they strengthened my legs because my legs felt sore from them only during the first time. I guess I got use to them and chucks do feel more natural than today’s flashy 200 dollar sneakers. One guy went up to me and asked, “Don’t they hurt you to run in those?” and then he said “You should get real running sneakers.” near a bench by the track. I actually got injured running in Nike trainers a few years ago. 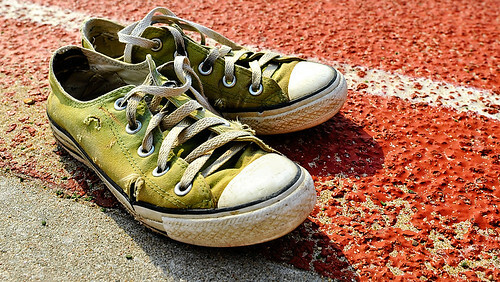 I’ve been running in Chucks a few times on a track recently and have no problems now. I guess it depends on how you land on your foot and not by how much cushioning the sneakers have.